kapunda garden: Thoughts on weeding, spraying, planting and food. Autumn is over… and we are close to winter. Thoughts on weeding, spraying, planting and food. After catching up with the growth in the garden yesterday, I began to think about the kinds of plants that I am growing and how to decide what to plant next. I have an acre of land, in total, but with a house, shed and some old outbuildings, the chook run and the goat pen and some patches that are hard to cultivate for vegetables because of some really large trees, the "productive patch" is quite reduced. However, it is hard to tell where the "productive" part ends and the rest starts. One of the old trees has bees living in it. They have been there for years and they are the main pollinators for my vegetables. I haven't raided the hive (for honey) for years but the hive could hardly be left in the unproductive list and it's the same with the birds. I have a significant population of native and non-native species and many of these are insectivorous. There are lizards and frogs and an assortment of other creatures and, if nothing else, I know that the soil and plants are healthy while all of these creatures survive and prosper. In the past I have planted quite a variety of odd and interesting vegetables. Some have been successful and some… not so much. I like to try a few new varieties most years. However, this year, after a chaotic patch in hte rest of my life, I have mostly stuck to the tried and true and to seeds that I have saved and everything seems to be thriving and producing plenty of food. With these varieties, I still have enough variety for health, quite diverse meals with still plenty of new recipes to try, all seasonally, of course. As I have often mentioned previously, the "trick" to growing food in my patch is understanding the soil and I suspect that this is the most useful procedure in most places. In my garden, I have clay soil overlying limestone that is situated on a very old continent (hence the small particles making up the soil) that has been leached of minerals over many millions of years. It is said to be poor, alkaline and "non-wetting" soil and I have been advised on many occasions that it "won't grow much". Most of the fields here are cultivated ready for planting, covered with herbicides and then seeds and superphosphate… with further additions of nitrogen (which makes the green leaves a brilliant colour later in the season) and then wait for winter rain. The soil seems to be similar to a hydroponic substrate with seeds and nutrients added (pesticides as needed) and just wait for the crop to grow. The fertiliser that is added is superphosphate and this is made from minerals, some of which are mined and are past peak production, notably rock phosphate from very old deposits. Phosphate fertiliser was invented many years ago, and has since been improved by adding trace elements as these become depleted in soil that is used over and over again without retuning any minerals as they are used and exported. In my part of Australia, the level of trace elements was low to begin with because of this leaching by rain and run-off over millions of years and so this discovery of additives for superphosphate has been spectacular and plants have been bred especially to suit the new products…. this was called the green revolution. The problem with this strategy is that the soil materials are used up, often harvested and shipped off, and the phosphate, nitrogen and potassium has to be replaced annually, along with some of the trace elements that are in short supply. Peak phosphate is a serious issue, but so is peak oil. The energy required to produce the inputs for our major food plants in not sustainable. Adding valuable nutrients to the soil to grow crops, only to harvest and ship the nutrients away or flush them down the toilet and often out to sea is shortsighted. Recycling in this context is absolutely essential. This is not new information. Peasant farmers for thousands of years have known that for soil productivity to be maintained essential nutrients need to be conserved and recycled. It is only since the "green revolution" that this "hydroponic" method has been used and with it, the energy input when compared with energy output has escalated greatly. But, back to my garden…. I compost all of the weeds and whatever is able to grow in the soil here. The plants with nice deep roots are able to retrieve any minerals that are available further down than some of my vegetables are able to. I have added rock dust instead of soluble mineral fertilisers that have to be added frequently and I have added every kind of organic matter to the soil that I can find. My garden beds look as though I have imported soil to make them into "raised beds" but, in fact, I have only dug and added organic material (mostly composted weeds and chicken droppings) until the volume of the soil is significantly increased and I am left with "raised beds. These are also quite useful for the clay soil which, once wet, remains so for longer than the looser, sandier soils that I sometimes envy. However, this soil is different from that which I found when I first moved here. The perfect hard-packed clay was hard to dig, and water would not penetrate it. When I broke the surface, the fine powder could blow away, and if water was added, it sat in a pool contained by its own surface tension. Eventually, over the winter, the soil does get wetter and heavier and plastic… only to crack in patterns reminiscent of a clay pan in the bush as it dries out. There are still parts of the yard like that. But where I have been adding straw, rock dust and compost, the soil is darker, crumbly and full of worms. Those worms are my indicators of health. 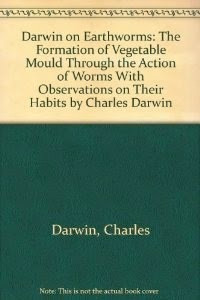 My grandmother used to tell me that worms indicated "good soil" and that is true. It is also true that the millions of micro-organisms and fungi that are mostly unseen, but which need the same conditions as all of those worms are just as important. The worms are the "canaries in the coal mine" for me…. indicating that the soil is healthy. I am not sure how modern pesticides change the soil micro-organisms and their "canaries", the worms, but I am suspicious that weeding with glyphosate, even in backyard gardens does more harm than good as far as the soil goes. 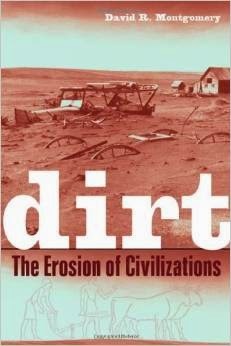 A more up-to-date publication by David Montgomery about the importance of soil was published in 2007. This describes our dependence on the soil for our survival. This is what I have been thinking as I pull deep-rooted marshmallow weeds, stinging nettles and some thistles for the chickens before collecting enough food for my dinner this evening. Hi Jane, Where do you buy rock dust from? I live not too far away from you in Gawler and your soil sounds exactly like mine. It would be wonderful if I could improve so that it retained the water better especially in the summer. Rock dust won't increase water retention directly, though it does improve plant health which in turn will help with that. Rock dust is an improvement on adding trace elements. Gypsum helps to make the soil less non-wetting (sounds like a double negative, somehow, but I hope it makes sense) and is useful for clay soils. The water retention in summer is best achieved by adding organic material, I have found. It's true though that in summer the plants jsut need more water… the same as I do on hot days. In dry weather, plants will be losing water faster than when evaporation is less and so you just have to add more to the soil which is their only source of hydration. Improved soil does make a big difference though, and starting from alkaline clay, the strategy is a bit different from the regualr descriptions in gardening books, tv programmes and such. Jane, in 1909, Franklin Hiram King visited China, and observed daily carvans of handcarts hauling 60 gallon containers of night soil from the city back to the farm. He described this in Farmers of Forty Centuries. My review is here. Julian Grigg says that, if cities survive, they MUST recycle the nutrients in their soil. Thankyou for that. I am part way through reading the King book online… interesting. I enjoyed your review also. You're right, there is no sustainable way to remove nutrients from the soil indefinitely without destroying the place that one is using… you can't get something for nothing! I really believe that we are (collectively) on a dead end path, and while it is sad, one can only live a "life of excellence"…. as Guy McPherson puts it. Thank you for the information on rock dust and gypsum Jane. I will definitely be putting some into the soil before summer arrives. I've been looking for a big bag of rock dust for a while. The stuff from Diggers is pretty expensive. I've seen the results of using it and will continue to try and source it locally (I'm in Gawler).